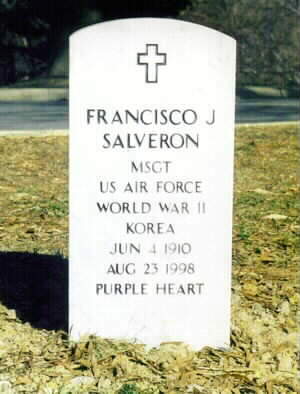 Francisco J. Salveron, 88, a retired Air Force master sergeant who was a personal aide to General Douglas MacArthur during World War II and waded ashore with him during the general's triumphant return to the Philippines, died August 23, 1998 at his Bladensburg, Maryland, home. He had lung cancer. Mr. Salveron appears in the photographs of MacArthur's march onto the island of Leyte on October 20, 1944, among the most famous images of the war. MacArthur had pledged to take back the islands from the Japanese, and the occasion was well documented by photographers. Later, bronze statues fashioned after the photos were erected at the beach. Mr. Salveron is among those depicted. Mr. Salveron, a native of the Philippines who had been conscripted into the U.S. Army in 1942, met MacArthur while recuperating in a hospital. He had been wounded in the shoulder when his ship, the Don Isidro, was sunk as it was transporting medical supplies to Allied forces. Only a third of the crew survived. MacArthur asked him to serve as his aide, and for the next three years Mr. Salveron was with him seven days a week. He later recounted that he woke the general every morning at 4, cooked him two eggs and bacon, prepared his uniforms and loaded his carbines. After the war ended, Mr. Salveron and his family moved to the United States and settled in Bladensburg. He enlisted in the Air Force and was assigned to the flight crew of General Dwight D. Eisenhower. He later served as a flight steward to President Harry S. Truman and to a series of secretaries of defense and state. Mr. Salveron retired in 1963 and devoted the rest of his life to volunteer work in Bladensburg and to preserving the MacArthur legend. He founded the General Douglas MacArthur post of the Veterans of Foreign Wars and was its commander for 21 years. He and his wife, Anastacia, were active with the Bladensburg Promotion Committee and its work to restore the town's Peace Cross memorial. They also helped raise money for a memorial there to veterans of the wars in Korea and Vietnam and were participants in the town's long-established Fourth of July ceremonies. Mr. Salveron was named Outstanding Senior Citizen by the Prince George's County and Maryland Jaycee organizations in 1983. His military honors included a Bronze Star, a Purple Heart and three Presidential Distinguished Citations. He was also a member of First Baptist Church of Hyattsville and the American Legion. In addition to his wife of 66 years, of Bladensburg, survivors include four children, Norma Moore of Arlington, Arthur "Bobby" Salveron of Bowie, Alice Bell of Fairfax Station and Eveline "Bebe" Overmiller of Frederick, Md. ; nine grandchildren; and two great-grandchildren. A son, Robert Lovett Salveron, died in 1971, and a daughter, Erlinda McDaniel, died 20 years later. On Sunday, August 23, 1998, of Bladensburg, MD, beloved husband of Anastacia D. Salveron; father of Norma S. Moore, Arthur R. Salveron, Alice J. Bell and Eveline N. ''Bebe'' Overmiller. Also survived by nine grandchildren and two great grandchildren. FFuneral service will be held at Hyattsville Baptist Church, 5701 42nd Ave., Hyattsville, MD 20781, Monday at 9 a.m. followed by an additional service at 11 a.m. at Ft. Myer (Old Post) Chapel with interment in Arlington National Cemetery. In lieu of flowers, memorial contributions may be made to Hyattsville Baptist Church.